Noritake released its new faceted glass tumblers and goblets to make any dinner party one to remember. 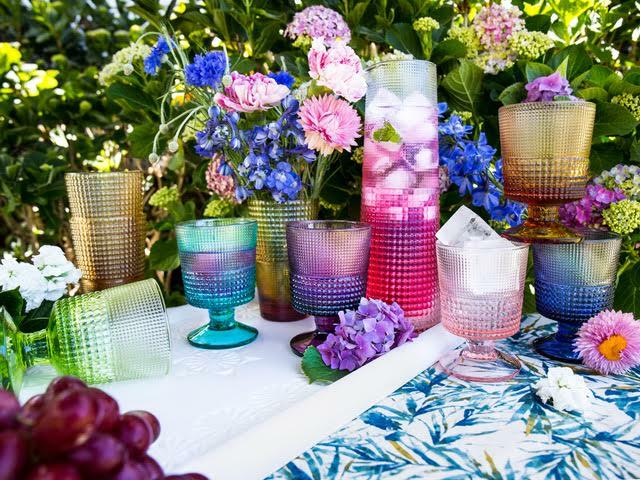 Handmade in Italy these faceted glass tumblers and goblets will create a jewelled theme to table settings during this summer season. Sip on lush fruit waters, cool crushes and fruity cocktails, but do it all in style and serve in Noritake’s beautiful tumblers or goblets. The collection sets the tone with a mix of stunning spring and summer inspired colours of amethyst, midnight blue, lime green, pink, turquoise and amber. A clear glass option is also available if you prefer be a little more subtle. Noritake haven’t left out anything with this new collection adding a matching 1.5 litre carafe, in clear faceted glass, the perfect companion to both goblets and tumblers. IVV has been Italy’s leading specialist in artisanal handmade glass for more than 60 years and Speedy is one of the most successful collections to date. Noritake faceted glass tumbler and goblets are available nationally from leading kitchenware retailers and departments stores. Get your set today and start celebrating summer! Cheers to that!